One of the original objectives for the server-side work was to look at what's involved in launching and interacting with various server-side containers. Currently, there is actively maintained work in support of embedding in a servlet container. Launches the framework and provides a place for the framework to hook back into the servlet container. Hooks back into the servlet bridge and proxies requests through to the servlet container to provide an OSGi Http Service. Provides the HttpServiceServlet used by http.servletbridge that when initialized registers an OSGi Http Service. Provides servlet, resource, and httpcontext extension points based on an OSGi HttpService. These four project can be downloaded from the equinox CVS depot. To develop web applications you'll also need the javax.servlet bundle from the Orbit CVS depot. To build and use these projects you'll need to be running the Eclipse SDK 3.2 or later. This set of instructions should get you up and running in a just a few minutes. At this point you should begin familiarizing yourself with the use of the OSGi console to manage the platform. You might also see if you can install and start the http-console bundle described here. commandline Allows all non-VM command line parameterizations of Eclipse. The default value is "-console" to allow you to use the console to "experiment" with managing an active framework (e.g. installing, starting, stopping, uninstalling bundles etc.). Currently the console is configured to run directly off standard input/output of the launching appserver's process. The functionality offered by either approach is very similar. The extension points in org.eclipse.equinox.http.registry are simply a mapping of the OSGi HttpService. The above structure is meant to be very close to an RCP application with the /eclipse directory holding something similar to an RCP application (but naturally containing components more suitable for server side interaction). These two pieces should then be combined by placing the eclipse portion in the "/eclipse" directory. org.eclipse.equinox.servletbridge contains an ant script in "/scripts/webAppBuilder.xml" that can be used from the IDE for constructing the war file structure above. (It can also be used for a head-less build by customizing various properties) Additionally "/tempates" provides the resource content like the web.xml, launch.ini, and config.ini which might also be customized. Right-Click on the webAppBuilder.xml script in the IDE and "Run Ant". As with RCP applications there are a wide variety of possible configurations. 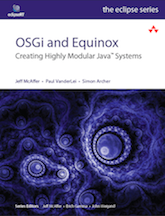 What's given in org.eclipse.equinox.servletbridge.feature is just one possibility.